Derrick turned 40 this year so I make him a little birthday cake (which was late) but it was the thought that counts! Right Derrick. 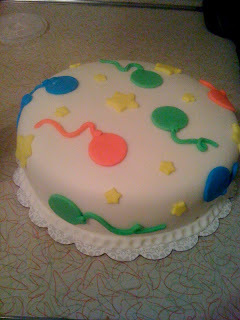 This cake was my first attempt at using fondant. I love using fondant. I can be very very creating with it. I make my own fondant and it tastes yummy. So when people tell me they don't like the taste of fondant I tell them I make mine homemade and it tastes good. I have got a lot of compliments about it!